I am straight up obsessed with this military shirt from American Eagle! I love it both equally open over a tank with cuttoffs, or buttoned and tucked in like above. Also, you’re about to see how many things I own in the color olive lol. 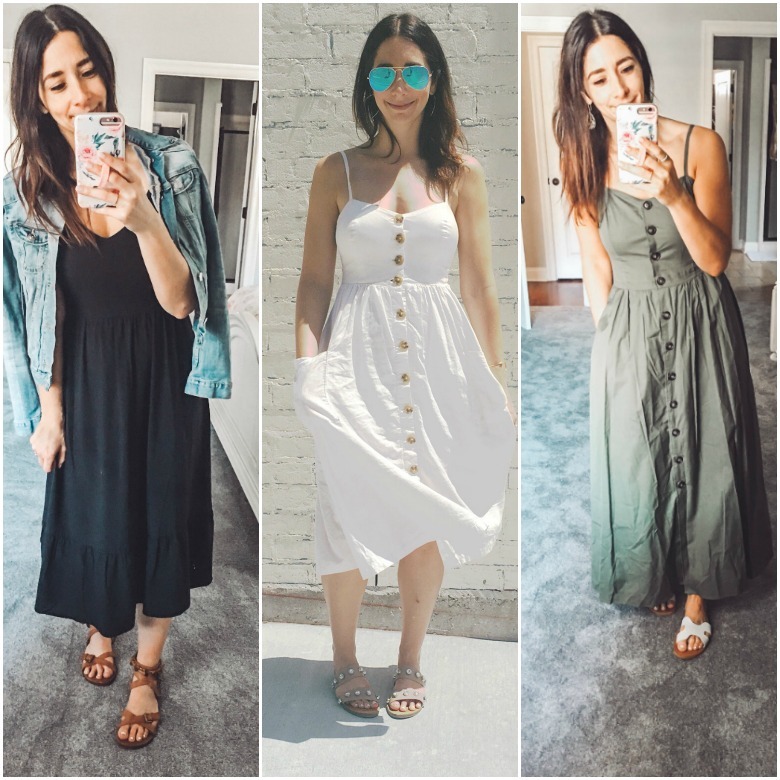 I really love buying a couple of super simple, basic dresses each summer and wearing them to death (see more below!) This one from Old Navy feels like a dream on, and is so lightweight and breezy and perfect for warmer weather. I’ve worn it twice, casually and with a kimono for a family dinner. Tank (wearing a smize small, but wished I had sized up to a medium); Abercrombie b/f jeans, old…similar here; Similar kimono; Target slides; Stella + Dot Bellamy clutch, Kari necklace. I wore the above outfit for a busy day of errands and softball practices, but wanted to style it for a date night as well (what are those, btw?!) I really love how a kimono can make any outfit better (the one I am wearing is old, but I am seriously considering buying this one), and how cute is my camo clutch? I have a couple of clutches from Stella + Dot (I’m a stylist!) and think they are amazing. These overalls have been a staple in my closet for YEARS and are probably my most favorite investment, ever. I also have this cardigan in 2 colors (this pretty rose and a cream!) and think it is perfection, especially for the price! I bought this tank in two colors after looking at them online FOREVER, and I am so glad I did! They are generously sized, I’m in a small, and I will wear these to death. And these pants are the most comfortable jeans ever. I size up in this brand alwaysi I typically wear a size 4 or 6, and these are an 8 and fit just right. And finally, I mentioned above how much I love wearing dresses. 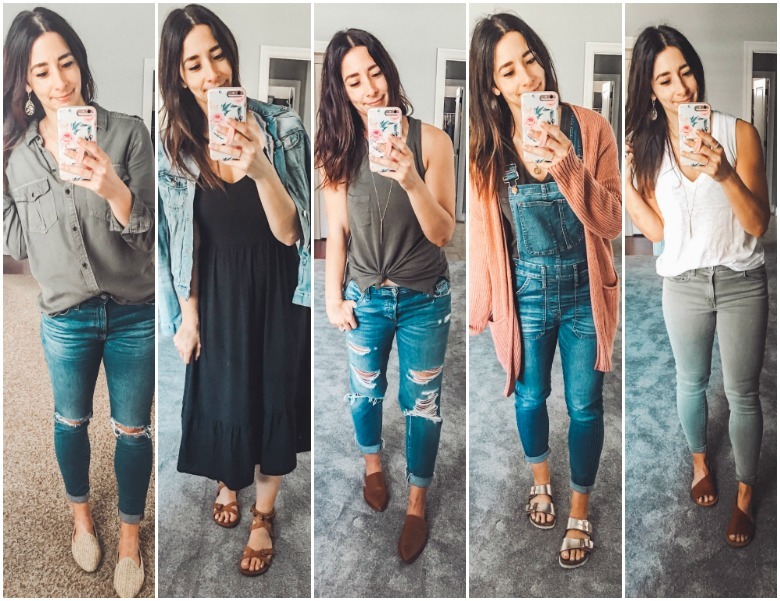 They are part of my “uniform” that I choose in my capsule wardrobe system, and I am always on the lookout for a great, neutral dress. The one in the middle (in white) is several years old and is STILL my favorite dress, and I found several very similar versions for you! I always get a lot of compliments when I wear it and I feel like an old fashioned movie star in it. And this one has pretty, tie straps! P.S. Please check out my FREE guide below, how to find uniforms that will make getting dressed each day a breeze!